The people of Hoi An love eating out. In the 16-19th centuries, the town was teeming with foreign traders from China, Holland, Japan, Portugal, and all over the world. The bustling atmosphere lead to the invention of many of Hoi An’s most famous street foods, many of which are essentially central Vietnamese dishes infused with some foreign flavors. Now, hundreds of years later, the hobby, or rather, the habit lives on stronger than ever with Hoi An locals. At any hour of the day or night, there is a wide selection of snacks and meals to be found on innumerable street corners. Sometimes a quick seat is taken by a cyclo driver to suppress a sudden pang of hunger, or sometimes a large family or group of tourists take up a whole sidewalk eatery with long, festive – and often drunken – parties. At around 9-10 a.m., women who sell chè, a popular sweet soup in Vietnam, start their coal fires. They slowly take over the shadiest places on the sidewalks underneath the biggest trees, where their stalls, mobile kitchens and food carts become centers of gastronomy. Many kinds of chè are popular in Hoi An, but the local favorite and specialty is đậu ván (hyacinth beans), which is not only a sweet dessert, but also helps cool the body down during central Vietnam’s punishingly hot summers. A bowl of chè đậu ván usually has a few gelatin-like black chunks of lường phảnh. The Chinese jelly is made from a plant of the same name mixed with some herbs known to boost health, immunity and hydration/refreshment on hot days. It gets its jelly-like quality from the rice flour or cassava flour that thickens the concoction. With a bowl of chè đậu ván, a few drops of kumquat juice are a must. Without the kumquat, the soup will lose half of its tastiness. At around 3-4 p.m., the historic old town is crowded with street food vendors filling the air with the enticing scents of everything from bánh bột lọc (dumplings with shrimp and, sometimes, pork) to bánh ướt thịt nướng (thin pancakes with grilled pork). These snacks are cheap and not very filling, so it’s good to take in a few appetizers while walking around before dinner. 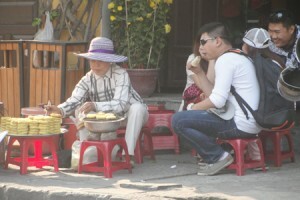 Bánh bèo (steamed rice pancakes) – a well-known food from the central region – is considered the town’s afternoon snack. Compared to the small, thin pancakes from Hue usually served at expensive restaurants, the Hoi An variant of bánh bèo is larger and thicker. Its sauce is made from rice flour stirred with minced shrimp and pork, and it’s relatively thick. An essential partner for bánh bèo is ram, which is fried noodles and nước mắm (fish sauce) mixed with chilies and garlic, used as a dipping sauce. For a nighttime snack, nothing is more enjoyable than sitting on a bench along the Hoai River with a bánh mì (Vietnamese sandwiches) from Phuong Bakery near Cam Nam Bridge. Occasionally hailed as the best bánh mì in Vietnam (at least that’s what American celebrity chef and TV personality Anthony Bourdain said), Phuong’s bánh mì is a splendid mix of pâté, pork, chả lụa (kind of like pork bologna), vegetables, and sauces. Every baguette is hot and crunchy, while all the ingredients are added liberally, but not excessively like many stands in Ho Chi Minh City. These sandwiches are tasty until the last bite and it is not uncommon to order a second. When it comes to Vietnamese cuisine, phở is probably the most popular dish. It has gone global and is now the most well-known Vietnamese food in the world. Don’t miss the unique phở in Hoi An, where many locals have the beef noodle soup for breakfast at Lien restaurant every morning. Located in the center of the town, the 500-year-old restaurant is the only and oldest of its kind in the town. Phở Lien, as people often call it, is unlike any phở sold in the north or south. First, its noodles are not totally soft, but kind of hard, and somewhat crunchy – al dente if you will. Hoi An doesn’t like its noodles soft. Its famous cao lầu noodles are cooked al dente as well. Lien’s cooks dry the noodles in the sunlight extra long to give them their crunch. They then soften just the right amount, not too much, after just one dunk in the hot broth. Second, Lien’s broth not only has the sweetness of beef bones but also the buttery and spicy taste of peanuts with dried chilies. Aside from coming with the standard fresh basil as a condiment, the restaurant’s owners also offer sliced papaya fermented with vinegar. A treat! Like most culinary capitals, the food in Hoi An is various with location, time of day and even with seasons and festivals. But no matter where or when you are in Hoi An, locals are making an excuse to eat somewhere, sometime, and you can bet it’s something delicious.